A quick Google search on the subject of retirement readiness quickly resulted in an overarching feeling that Americans have rapidly been falling behind. For instance, one-third of Americans currently have no retirement savings, according to a recent GoBankingRates survey. So what about you? Will you have enough saved in retirement? Will your retirement be sustainable? For military members, ‘retirement’ has taken on a whole new set of complications with the updated pension system the government is rolling out in 2018. 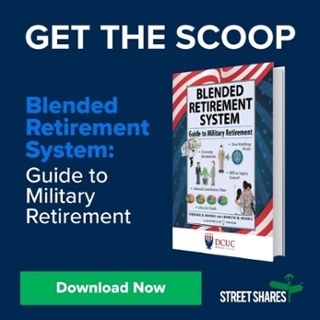 We’ve provided a guide and outlined the general implications of this Blended Retirement System (BRS), such as whom it affects and when the changes will begin to be implemented; however, there are deeper weeds to dig into about how specifically this new BRS plan will truly affect military members’ retirement from a “numbers” perspective. Let’s look at how the military’s pension plans, old and new, work and how to think about building your savings for retirement. *The retired base pay is an average compilation of the pay that the service member received at their highest rank, for a consecutive 36 months. 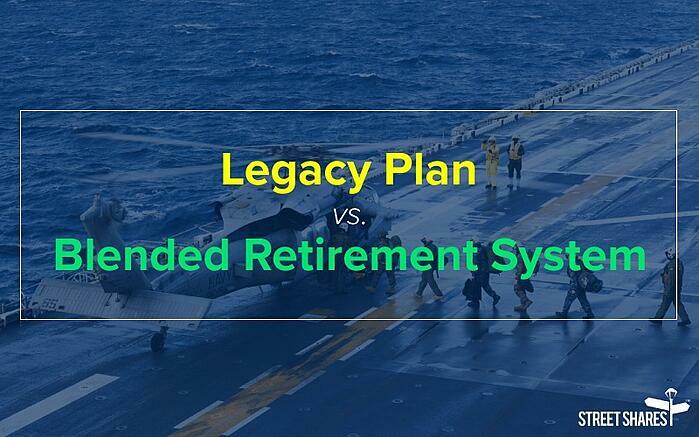 With the current Legacy plan, there is no equivalent of a civilian 401(k) matching retirement plan as part of this benefit. 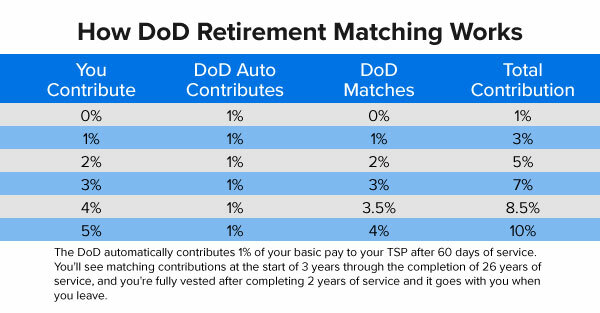 Military members can invest funds into the Thrift Savings Plan (TSP) but there is no matching element under the legacy system. A key part of the legacy system is the requirement to serve a full 20 years to receive any type of pension benefit. While military members do have the ability to open a Thrift Savings Plan (TSP) account – a retirement savings account specifically for Federal employees and military members – there is a major difference between a typical 401(k) and the TSP. The TSP does not have any ‘matching’ funds program like most 401(k)s do. The burden is completely on the service member to open an account, make contributions, and grow their savings while in service. Within the TSP, however, one unique benefit is that there are two types of contributions service members can choose between: traditional contributions or Roth contributions. With traditional contributions, you defer paying taxes until the money is withdrawn. With Roth contributions, you pay taxes as you make them and then your withdrawals are tax-free. 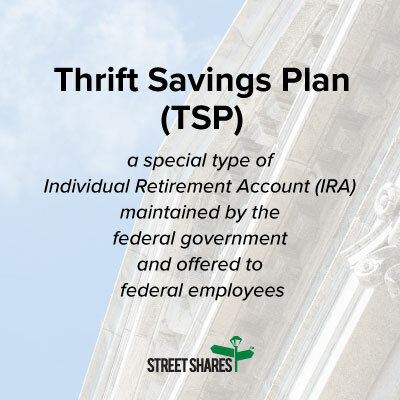 With Roth TSP contributions, much like you would find in a civilian Roth 401(k), rather than a Roth IRA, there are no income limits for contributions and you can contribute up to $18,000 this year. These two types of contributions help when making your retirement tax-planning decisions. Additionally, it’s important to remember that any retirement savings account will have costs associated with the administration of the account or the specific fund you choose, otherwise known as an expense ratio. With the TSP, this management fee is extremely low; on average 0.038%, or a mere $0.38 per $1,000 invested, whereas other offerings typically range around 1% or higher – a significant difference! In summary, while the Legacy Plan currently provides a higher quality pension, a major difference with the BRS is that you must serve at a minimum of 20 years in order to be eligible, and secondly that there is no government-matching in the TSP. See also: When Should You Cash Out Your Thrift Savings Plan (TSP)? Same service member, same number of years of service, and yet $850 less per month in pension benefits! To make up for this 20% decline, the military decided to switch to something more akin to a civilian 401(k) retirement plan and put some of the responsibility for retirement income back on the service member. Through the BRS, the government will now fund an automatic 1% of a service member’s base pay each month directly into their TSP, starting once he or she has completed two months of service. Then, once that military member reaches three years of service, the military will begin offering a matching plan, matching up to an additional 4% of the service member’s base pay. A key component of the new plan allows service members that don’t complete a full 20 years of service to transition out of the military and still receive some transferable benefits in the form of the matching TSP payments. This chart represents what the Department of Defense states as its automatic and matching contributions, as stated at defense.gov. While there are benefits to both the legacy system and the BRS, service members have the potential to grow additional retirement savings through the BRS’ matching TSP plan. Yet, even with this new plan there are still limitations under the general TSP program. The TSP only offers six types of funds, with each one varying in strategy and risk; ranging from government securities that only earn interest, to bonds, to S&P 500 stocks, to small-cap stocks, to international stocks, to a life-cycle fund. In summary, under the new BRS plan, the government-match is a benefit that service members can utilize to help offset a smaller pension. 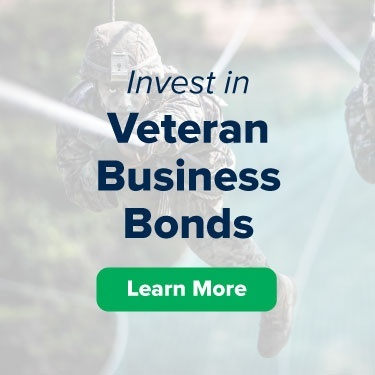 To fully capture this benefit, however, service members will need to contribute enough to receive the full government match, and will need to make smart investment decisions within the TSP fund offerings. To help you through your retirement planning process, our partners at the Defense Credit Union Council (DCUC) developed a guide. 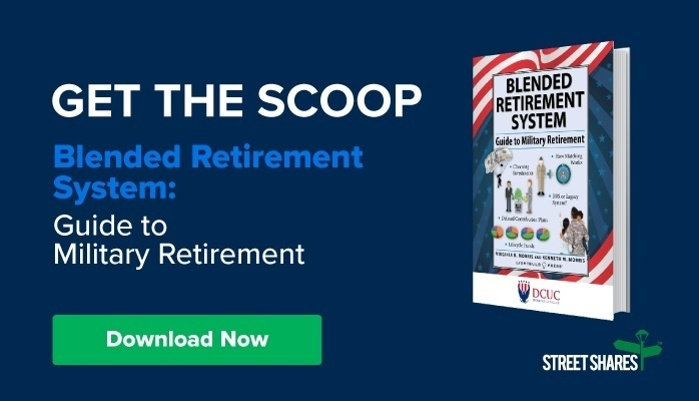 It provides a total view of what to be thinking about when planning for retirement and gives all of the details you need to know about the new Blended Retirement System. Download it now. This content is for informational purposes only and may not contain all material information about financial planning, nor is it intended to address any particular reader's individual financial planning goals. This information is not intended to be, nor should it be construed or used as, financial, tax, legal, or investment advice. Please consult with your advisor regarding your financial planning and/or retirement goals. Previous Post: Who Is Allowed to Check Your Credit Reports? StreetShares operates in California under CFL License #60DBO 44064. All terms subject to approval. All information is for informational purposes only. Please see your StreetShares representative for more details. This does not constitute and offer to sell or the solicitation of an offer to buy any securities.